Project: Order of the Tyger's Cub for my niece, Veronica Vesalius. I did both the calligraphy and illumination on this scroll. Words: by Lord Iain of Malagentia. Ink: Winsor & Newton Sepia calligraphy ink. Illumination Materials: The ink surrounding the gold leafed areas is India ink from a Rapidograph pen. The Sizing for the Gold is Miniatum with some red W&N ink added to help see where it was painted. The paint is all Holbein Gouache, most of it custom mixed colors. 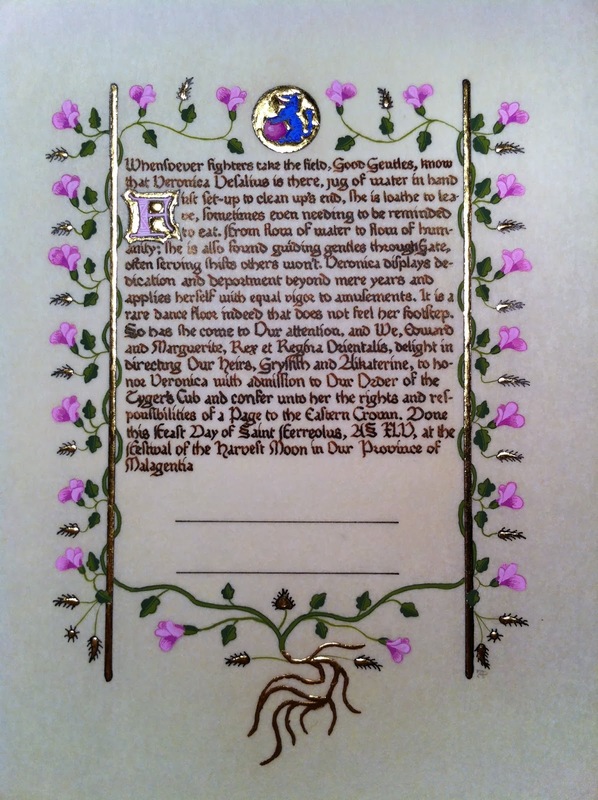 I completed this scroll in September of 2010 for presentation to my niece in October at Malagentia's Harvest Moon event. The Tyger's Cub is given to youth in the SCA who "display admirable virtue and decorum at events." I used this project as an opportunity to see just how small I could make my calligraphy. Due to the number of words in the award text far exceeding the original source, I decided to shrink the text size to allow it to all fit inside the illuminated border. Alternately, I could have extended the border so the size of the flowers and text stayed in the proportions of the original. The inspiration for this piece is a page from the Prayer Book of Michelino Da Besozzo. I used nib that was only half a millimeter wide on this project. The minim height was about 2mm. There are almost 7 lines of text per inch. The finished calligraphy, with a drafting pencil for scale. A pencil sketch of the illumination. Next I painted a couple coats of Miniatum, a modern sizing that leaves a raised surface the gold leaf will adhere to. Miniatum is clear, so to be able to see where I was painting I added a few drops of red ink. Why red? Some of the gesso used to build up raised areas under gold in period documents was colored red/pink. If the gold is put down well, you don't see the color, though it may affect the color of the final gold leaf a little. I know other artists who prefer to use yellow coloring in case the gold is scraped or so thin that the background shows through. One detail I really love about the original is how the roots are not outlined with ink. My roots aren't quite as thin as the original, but I still love the effect. Once the Miniatum had dried enough, I added the gold leaf. Here it is with a ruler and Quarter shown for scale. Now on to the paint. I started with the brighter green of the leaves and vines. Then I added the darker green shading and outlining. The first darker pink shading. Coloring in the badge of the Order of the Tyger's Cub. The finished scroll shown once again. I added additional highlights and shadows to the flowers to give them depth.